A fresh, not out of a can, cranberry relish for accompanying that Thanksgiving turkey and fixings. 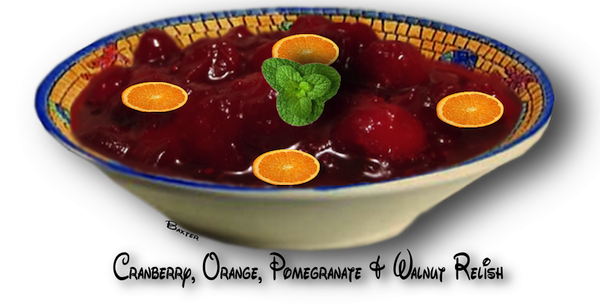 Why not enjoy a fresh cranberry sauce at Thanksgiving instead of that congealed mass of "who knows what?" out of a can. This relish is made of fresh cranberries, fresh oranges and fresh pomegranate with nuts of your choice. The taste is a pleasure to behold! process too fine. You may want to boil a few whole ones to show up in your relish. A nice touch! 2. Process the orange by removing all the outer zest, orange part only,  discard all the white pithy part. Place all the orange and zest in the food processor and process until you have a fine slurry. 3. Mix the Jello® as per instructions on the box. raspberries. Stir in the sugar and blend well to dissolve the sugar. Place in the refrigerator to "jell" or congeal. topping , cheesecake or tart glaze or use your imagination. This relish will freeze well so you can enjoy a few more times during the New Year.